Overall comment: Your pathway back to nature - a peaceful, chillax cafe with good coffee & simple food to pair with your favorite coffee. It has been 8 years now since Gilbert arrived at Malaysia. A Korean at birth, Gilbert Kim & his wife are passionate about good coffee & simple, yet delicious food. With a passionate heart & mind, they started the homey & natural-looking Cafe Olle last December at Desa Sri Hartamas. Olle means 'pathway to the nature' & it's actually a narrow pathway surrounding Jeju Island in South Korea. The routes pass through various landscapes along the way including small villages, beaches, farms, forests & parasitic volcanoes. The philosophy of Olle Cafe is simple: "The pathway is here. Come over any time & take time to enjoy your dining experience here." With such an 'all-natural' & homey ambiance, I'll certainly enjoy my time here! Here at Cafe Olle, you'll find your favorite cup of coffee (tea & juice too) along with some simple variety of food like sandwiches, pastas & the Olle Signature Brunch to accompany your drink. Each cup of aromatic coffee comes with pretty coffee-art. Bamboo salt?? Bamboo salt has healing properties & I can testify that it's MUCH SALTIER than the usual salt! Oh my, my...but it gives a good twist to the simple coffee! A good balance of coffee & chocolate. I enjoyed this! "Kao" & lovely - vanilla gelato with a shot of espresso. We were also introduced to some of Cafe Olle's favorite/popular dishes. You'll get to enjoy all their sandwiches throughout the day & their pastas from 11:00a.m. - 8:30p.m. Gilbert's favorite! I've never really had a grilled vegetables sandwich! Who would have thought to have a non-meat sandwich? My 1st thought was that, "Er...veggie & bread??" Haha. This surprised me. A sandwich that tastes fresh, healthy & pleasant in the mouth. The grilled peppers were sweet with a hint of smokiness from the grill & the freshly baked ciabatta just complemented the grilled vegetables, cheese & honey mustard well. This is my classic breakfast & any-time-of-the-day sandwich while I'm at home! I certainly do not have any complaints for this sandwich. The focaccia brings this simple beef salami & cheese sandwich to the next level. It's certainly a more dense type of bread compared to the wholewheat & ciabatta, but I love the bite & texture that it gives to the sandwich. Who doesn't like meaty, juicy meatballs? These flavorful beef + chicken meatballs went well with the fresh-flavored tomato sauce & spaghetti. The spaghetti isn't al dante, so if you prefer al dante, you'll have to inform the waiter. Another surprise. So simple yet delectable. Grilled vegetables & mushrooms in cream sauce with linguine! I enjoyed such simplicity here at Cafe Olle. Olle's Special Brunch (RM15.00/serving) - available from 9:00a.m. - 8:30p.m. That's quite an extended brunch! It's a very simple & healthy set of grilled organic tomato, french beans, Omega3 omelette, steamed chicken sausage, chef's fresh fruit yogurt, & focaccia with balsamic vinegar + olive oil. Koreans really strive for healthy living & Malaysians could learn from this dish! :D I have to say that the organic tomato especially is REALLY sweet! This brand that they use is only available at international grocers. For some good coffee with simple sandwiches & pasta, you can be sure that Cafe Olle could make your day. The Gala Launch for the MIGF 2014 (one of the largest, if not the largest, gourmet festivals in town each year) was held at the Sunway Pyramid Convention Centre late last month, 26th September 2014. This year marks the 14th year of this festival, with 28 participating restaurants & a good number of Red Hot Chefs. The event was certainly filled with excitement & festivity. Almost everyone was dressed in their best & waiters were walking around serving drinks & small bites to all guest. I proceeded to the Media Registration Desk, where I was asked by a lady for my name. After informing her, she said in a rather impolite manner that my name isn't in the list & didn't provide any advice on what I should do next. The slight commotion made the organizing chairman, Dato' Steve Day, come over to check on the situation & I was rudely informed to go home & come the next day since my name wasn't in the guest list. I was probably too shocked & baffled by the treatment, but I am not that easily bullied, mind you. I showed them a printed copy of my email correspondence to the lady & Dato', which without apology, they showed me a crossed look, asked each other what they should do & to cut the story short, handed me the 'gourmet dollar booklets' grudgingly. Not very professional, eh? Without a doubt I was upset with the entire treatment as if I'm not even a human, & was tempted to just walk off, leaving the venue, but did not, since I took so much time & effort to get there already. I proceeded towards the entrance of the hall, where I was stopped by the 'security', who insisted that I have the media pass if I were to enter the hall. *sigh* I wasn't given anything apart from those 'gourmet dollar booklets' & had to walk back to the Media Registration Desk. I told another young chap who was at the desk that I needed the pass & he even asked in return if I was provided the media kit, which of course I said no. Upset, upset...I couldn't even comprehend my own emotions anymore. Thanking the guy, I walked towards the hall again & met up with some of my food blogger friends inside the hall, where we started taking photos & chit-chatted until we had another unpleasant encounter: we were impolitely 'chased' out of the hall without a reason. Am I in the wrong to be really crossed? To the very least, as the organizing committee, you could just tell all your guests to leave the hall first & come back later as the photo-taking session was over (or for whatever reason you had to have the hall vacated). We walked out of the hall, not feeling like well-treated guests, & actually spent an hour lingering outside without anything much to look forward to. Everyone was telling me to chill, but it wasn't that easy to put emotions aside & try to enjoy the night. I struggled, I tried, & I held my tongue to only speak when required. Dear Lord, help me. We were all kinda starving as well, so I guess hungry people can be a little more angry people, no? Some of us ended up getting too bored of sitting around & just waiting that we decided to pop-by the Epicure International Gourmet Village in the next hall. The gourmet village showcased some new products available in the market, with some stalls providing samples for guests to try/taste. There weren't that many stalls to fill up our whole hour, so we took our own sweet time to browse through the stalls & check out the new food products in the market. One of the more interesting products at the gourmet market were home-made sausages from Heartland Foods. The sausages are currently not available at supermarkets, but customers could call or email to order & have the sausages delivered. I must say that the sausages are quite delish, especially the chili beef sausage! When we finally get to enter the hall/Theater of Cuisines for the Gala Launch, a few of us went around to check out each restaurant & cuisines showcased. You'll have to use your gourmet dollars in exchange for the small bites to taste-test the various cuisines cooked by the Red Hot Chefs. Different items will require different amount of points, from 1 to 3 points at the maximum. Fancy taking a photo with these ladies? All the Red Hot Chefs - well done! It was certainly an unforgettable experience at this year's MIGF Gala Launch. I hope that the organizing committee will improve on the way they treat their guests for subsequent MIGFs. 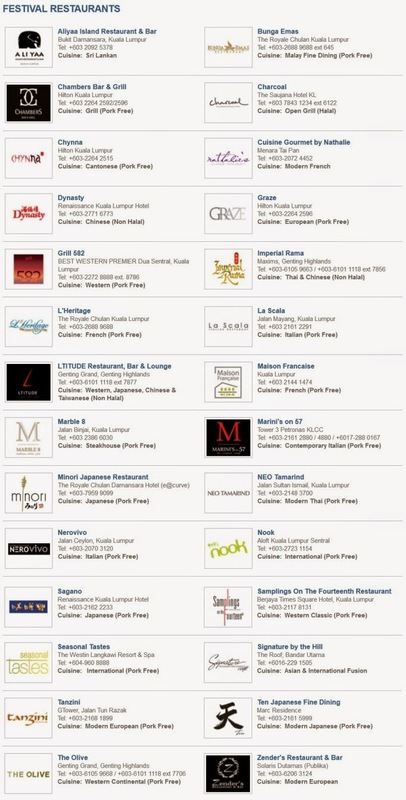 The festival actually lasts for the entire month of October from the 1st to 31st, with the 28 participating restaurants offering their special MIGF 2014 menu items, so do visit those restaurants & enjoy the variety of exquisite cuisines only available this month! p/s: For those who were wondering if I took any further action on the experience, I did write to the Head of PR, and the Head of PR called me after 10 days to apologize.